I have replaced the 1.8uf capacitors by 4.7uF as Martin Pelc advised and voila! - the sound improved incredibly as described by Martin!!! Many thanks for the advice, amazing value for the price. Nice design, small dimensions. 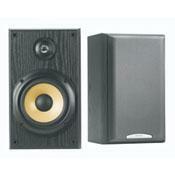 MidBass speaker and tweeter manufactured by new technologies - cheap but powerfull. Very good sound after slight modification mentioned above. I bought it as my second stereo for smaller room, powered by technics SA EX310 receiver. I was dissappointed by the sound, music was like hidden somewhere behind the wall. Then i decided to disassembly it and found problem! Tweeter has only one 1,8uF bipolar capacitor as crossover - this is cheap but not good. I have replaced it by 4,5uF polystyrene capacitor and WOW! The sound goes ahead of speakers and is clear and natural. MidBass speaker has kevlar basket, polypropylen cone and heavy coil magnet with two ferrite rings - really good solution. Now I am listening music with treble adjusted flat and bass control adjusted little bit more. The sound is really nice now and finally I decided not to buy any subwoofer for it - this is not necessary. Very good little speakers now! Bass and a volume control. Basically I purchased these speakers because the older model of Technics I had needed to go and I had a problem with one of them. I saw these because wasn't interested in spending $100 a piece and have been without surround sound for a year until yesterday. These speakers do the job as my rear surround speakers. The sound is great. In my opinion because I've always spent too much on audio. These are fine for the a small to medium sized room. I have a 550watt 5 channel Yamaha system and these work just fine and really fill out the overall sound. i'll review again in a year to make sure these last for what I need them for. I believe that are 110 watt capacity at 8 oms. Now as far as the bass on these it pretty full and but sound a bit hollow at times. Overall though for the $59 price tag there worth every penny.